﻿ So how does it compare with the GSX-R1000? 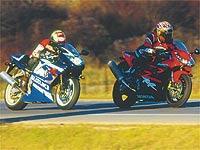 So how does it compare with the GSX-R1000? SUZUKI’S GSX-R1000 is the MCN Machine of the Year. We chose it as the best sports bike in our 14-bike shootout at Assen last year, and it has had endless awards and praise. But not everybody wants one on the road – hence the fact that the rest of the manufacturers still manage to sell their bikes. So what would make you choose the GSX-R over the new FireBlade? It depends what you’re looking for from your bike and your riding experience. In the simplest terms, if you’re a horsepower addict, you need the Suzuki. It weighs just 2kg (4.4lb) more than the 168kg (370lb) Blade yet makes 11bhp more. Image is another factor where for many the Suzuki wins hands-down. The original FireBlade was bad, but nothing has come close to the heritage of the GSX-R. From the early 750s, attributed as starting the whole race rep class, to the latest models, these are hooligan machines. Bikes that tell the world you’re not to be messed with. The Honda is much more sensible. Practicality may not spring to mind when you think race rep, but what’s the point of having the best bike if you can’t endure the ride to the track? The Honda manages to combine a comfy riding position with a sporty one. It will keep you relaxed on the way there, let you rip the circuit up when you arrive, and then dawdle home at your own pace. The Suzuki folds your legs that bit tighter, meaning serious distances will also need regular breaks. Amazingly, despite being more comfy, the Honda also makes the Suzuki feel big and long! At low speeds it turns much more effortlessly than the GSX-R – though that may be down to the Suzuki’s steering damper. At speed the tables are turned. The Suzuki feels totally stable where the Blade starts to get a little twitchy. But the twitchiness lets you know you’re travelling fast – the GSX-R needs to be into three figures before you really experience the speed. How long can your licence stand it? As far as price is concerned, there’s little to choose between them. The GSX-R is just £50 more than the Blade at £8750 – not enough to change your inclination towards one or the other. But any preference towards the GSX-R may be sorely tested by the extra cost of insurance – it lies in Group 17, one group higher than the Blade.